Digitize your paperwork with AceThinker PDF Converter Pro. It can also merge, compress, split, protect, unlock, and extract images from PDF, etc. Buy now for just $19.95. A Glance At The Guide For AceThinker PDF Converter Pro! Accelerate the way you create, prepare, & sign documents with AceThinker PDF Converter. Change and backup your PDF files to Microsoft Word, Excel, PowerPoint, Text, and HTML for editing more conveniently. Extract text from image-based PDF documents with the original format and graph using built-in OCR technology. Transfer the PDF format to EPUB for viewing on your mobiles devices like iPhone, iPad, Android, etc. Convert PDF files to popular image formats, including JPEG, PNG, BMP, GIF, TIFF, PPM, TGA and JPEG 2000. Want to convert PDFs in bulk so as to save your precious time? Now consider it’s done! AceThinker PDF Converter allows you to add multiple PDF files and convert them to different formats at one time in a single click. It also gives you the option to convert only the selected range of pages to suit your needs. A preview window is even offered for you to preview the source PDF so as to choose the right pages for conversion. This PDF file converter comes with a very clear interface and it takes only 3 simple steps to complete the PDF conversion. You don’t need to worry even if you’re a newbie as you can convert your PDF documents like a Pro in seconds! Super high output quality is ensured as all the original layouts, images, texts, hyperlinks, etc. will be preserved without any quality losing. Besides, you can also customize the layout and correct the direction of the file according to your specific needs. 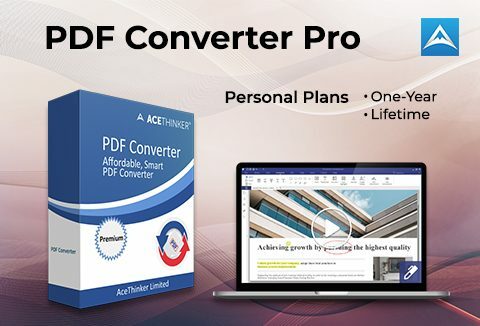 Why Choose AceThinker PDF Converter Pro? Click the Add File(s) button to import the PDF documents you’d like to convert. Or you can simply drag the target PDF to the main interface to directly load it for conversion. Click the drop-down menu of Output Format and choose your desired format from DOCX, PPTX, XLSX, JPG, HTML, etc. Meanwhile, select a folder to save the converted files. The last step is to click the Start button to convert your PDF files to the specified format. A window will then pop up showing you the converting progress. And it’s done! What People Think Of PDF Converter Pro! For Lifetime License (Personal), the customers will get free tech support and upgrades for lifetime. And the customers can use all the functions for lifetime. For One Year License (Personal), the customers will get free tech support and upgrades for 12 months. The license code will expire after 12 months and the customers need to renew the software in order to use all the functions. You're not allowed to proceed with commercial documents by using personal license. Manage your PDF files better with this effortless PDF Converter Pro. At A Deal Price Starting From $19.95 Only!